Identity, Power, and Issues faced by Women in Tech”, American University Student Podcast, Washington DC, December 2, 2018. “Embracing Personalization : Let's decode the connected world,” Women in Tech Summit, North Carolina, November 17, 2018. 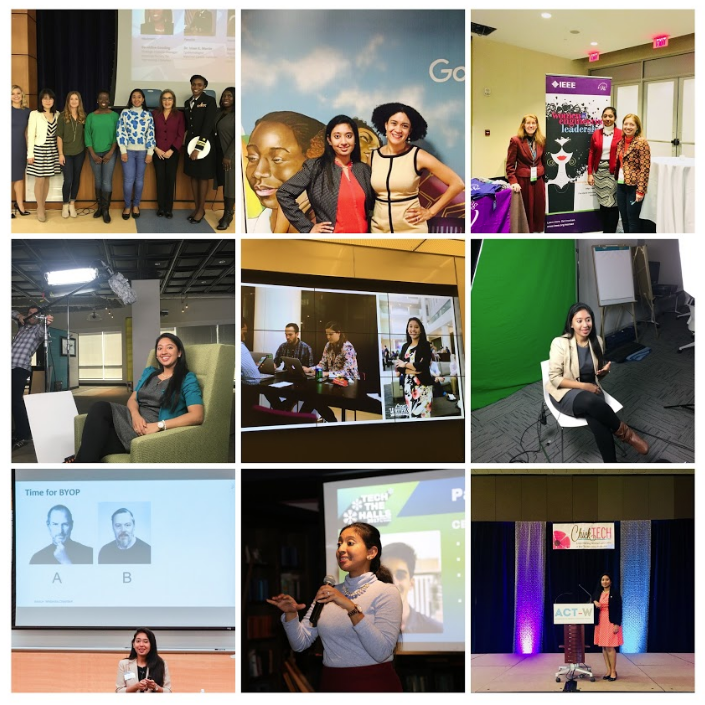 “Girls in Technology - Mentor protégé session #1 Speaker”, Girls in Technology, Microsoft, Washington DC, November 6, 2018. “International Day of the Girl - panel talk with female business leaders”, Malala Fund, the organization founded by student and Nobel laureate Malala Yousafzai, The Wing, Washington DC, October 11, 2018. “Transitioning beyond American University”, American University International Alumni Panel, Washington DC, October 6, 2018. “Finding the path : Are you ready?,” Advancing the Career of Technical Women, ACT - W, Phoenix, Arizona, April 11, 2018. “College Career Fair Panel,” Girls in Technology/Women in Technology, GIT/WIT, Washington DC, March 1, 2018. "Building 2030 : Diverse Cybersecurity Workforce Panel", Information System Security Association, January 24, 2018. "Soar like an Eagle and never look back”, Women in Manufacturing Podcast, January 2018. "Find your Inspiration", SANS Cybersecurity Initiative, Washington DC, December 15, 2017. TechWeek Conference Panel moderator, Newseum, Washington DC, October 6, 2017. "Diversity in Tech" Panel by Amazon Web Services, IN3DC, Washington DC, September 28, 2017. KEYNOTE : "From the moving diaries of an extroverted technologist", Advancing the Career of Technical Women, ACT - W, Boston, August 26, 2017. "Tech Leaders Today" Podcast, #STEM and #Diversity, August 3, 2017. "Un-Network Bootcamp" Speaker, The Mentor Method, Washington DC, July 2017. "Decoding your Technology Leadership brand", DC Code Writers Software Leadership Conference, Capital One, VA, June 9, 2017. "Are you ready to propel? ", University of Michigan - Ross School of Business, India Business Conference, Ann Arbor, Michigan, March 25, 2017. "Building an identity in Tech" Panel, Women in Tech Summit, WITS, The Washington Post, Washington DC, March 24, 2017. "My Cultural Journey as a Technologist ", WOW - World of Women, Notre Dame of Maryland University, Baltimore, MD, October 8, 2016. "Networking your brand in the Technology world", InPower Coffee Break webinar, September 27, 2016. "What if #Artificial Intelligence can see beyond the show and tell of #communication? ", Women in Technology TED style talk, WITx, VA, June 2016. "Stop Networking. Make a Career Connection", InPower Coffee Break webinar, May 31, 2016. "Being a Millennial leader", InPower Coffee Break webinar, April 5, 2016.